We love their excellent food, always competently prepared and brought to us by friendly servers. The dessert case stands at the counter, lighted up to turn the pies into jewels, making all of the sweet treats very tempting. Right next to Lefty's, through a connecting door is the perfect small bookshop, Mulberry Bush Book Store. Parking is easy. So after your excellent meal and a purchase in the Mulberry Bush, you are ready for some serious grocery shopping at Thrifty's which is their other neighbor. You will want to come back over and over again.... I do !!!!! I was walking around the wonderful town of Parksville with a friend and we decided we wanted to have some frozen iogurt from the local restaurant, Lefty's. We had been there before and it used to be a nice environment to hang out and enjoy a healthy alternative to ice cream filled with toppings and of plenty different flavours. I can't put in words how I felt when a really rude female employee with dark hair and sorta tall, served us. First of all she was being really loud inside the kitchen clearly annoying both coworkers and customers. When she finally took our orders she didn't even know the iogurt flavour options and when we asked her about the sign that said they had blackberry and strawberry flavoured ones, she said she knew nothing and rudely dodged our requests. When we filled our cups for our iogurts and looked for the toppings, there were none and she said it was none of her business. I would like to get back the Left's before people like her were in it, when there were frozen iogurt flavours and toppings. Thank you. 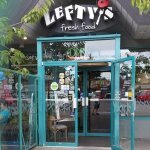 Been to Lefty's Pizza Fresh? Share your experiences!